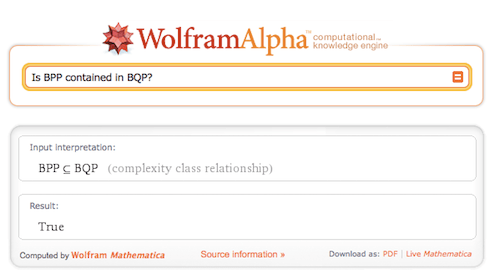 Via @fortnow, Wolfram Alpha is now offering answers to classical complexity queries (see blog post at the WolframAlpha Blog). Piece of crap. It won’t even say whether or not P=NP. I tested Wolfram Alpha on Emanuele Viola’s Theorem … “Are runtime bounds in P decidable?” … (correct answer: “no”) . Wolfram Alpha could not even parse the question, much less answer it, in a case for which TCS StackOverflow provided an answer within the hour.